Filmverse is a project I originated and which is funded and produced by the ATKV (Afrikaans Language and Culture Association). 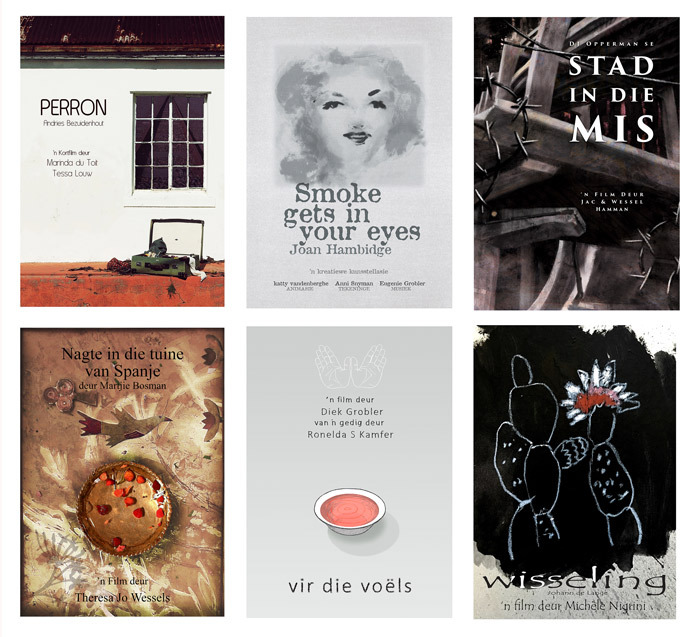 The project comprises a DVD of twelve animated poetry films, of twelve Afrikaans poems, by twelve artists. The first edition was completed in 2014, and the second will be released on 26 August 2016. Afrikaans is the third most common language in South Africa. It is spoken by 13.5% of the population, or 6 855 082 people – mainly ›coloured‹ and white South Africans. The language has its roots in 17th century Dutch, with influences from English, Malay, German, Portuguese, French, and some African languages. Afrikaans has a troubled history, from its origins as a kitchen language to its politicising as language of the oppressor during the Apartheid regime. Today it is perceived to be under threat by many, due to its loss of political and institutional power, as its political past drives continuing efforts to remove it as academic language at tertiary and even secondary educational institutions. Ironically, the majority of Afrikaans mother-tongue speakers are not white. 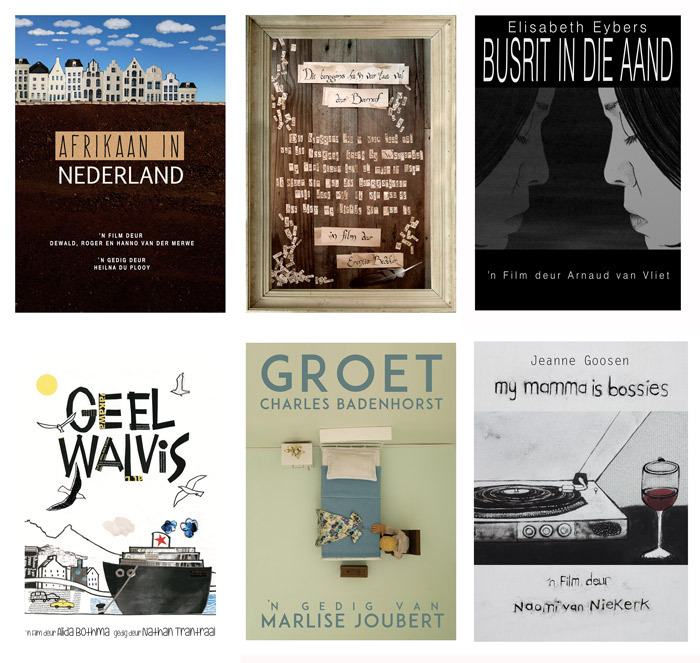 Afrikaans has a wealth of high quality literature and music, considering how young the language is. It is a modern language, with a direct simple structure. It is beautifully descriptive and extremely rich in idiomatic expressions. New words and expressions are being coined on an ongoing basis. Due to the politicising of the language, and the hybrid nature of the project (bureaucrats like neat boxes), I knew that it would be virtually impossible to get it funded by a governmental arts institution. My only option really, was the ATKV. The ATKV is a cultural organisation with language, the arts, communities and education as its main focus areas. Although it focuses on Afrikaans it is totally inclusive, and even multi-lingual, and creates and supports platforms to give the biggest impact and exposure to the arts, cultural and heritage activities. I made contact with Nita Cronjé in 2012, and as manager for productions and festivals, she was looking for a new visual arts project at the time. She immediately saw the potential of Filmverse to be a really important project for Afrikaans poetry. Animation is a costly endeavour, and we wanted to make 12 films. To justify the expense, we had to structure the project in such a way that the maximum outcomes could be obtained. This had an important influence on how exactly we structured our project: we had to emphasise the direct educational outcome of the project – the production of films which had value as visual aids in the teaching of poetry. This agenda directly influenced the choices we made regarding the poems to be used: It had to be representative of a broad spectrum of Afrikaans poetry, and had to include poems from different eras and genres. We had to include as many poems prescribed in the schools syllabus as possible, as well as get some new, representative voices on board. This is quite a daunting task if you only have 12 films with which to represent the poetry of a language. A shortlist of 20 poems were compiled by a panel of experts, and artists were invited to present a project proposal on a poem from this list. The styles and level of experience of participants were vast – from experienced, trained animators to artists working in animation for the very first time. As far as poet-participation goes, we had an assortment of responses as well: Some were deceased, a couple were difficult, most were happy to give permission for the use of their work, but since the concept was new and unusual to most, there was little interaction between the artists and the poets. It was left to me, as creative director, to be guardian of the poetry. It was important to us that the integrity of the poem should be honoured – the poem was never to be treated merely as a script for a film. Artists were selected on their interpretation of the poetry and their ability to match visual style to the content and spirit of the poem. The budget per film was very small; the equivalent of € 2.000 (disregarding the exchange rate). The down side to a small budget is that the artist cannot afford to focus exclusively on the project for a significant period of time; it is something to be focused on in your free time, which can be frustrating. The upside of a small budget is that you only get people who are really dedicated to the project to get on board. The commercial styles of animation, requiring lots of expensive hardware and hours of rigging and texturing are also, thankfully, absent. Stylistically one is left with exactly what you want – hand-made, developmental and experimental animation which suits the nature of poetry film. The styles and medium of animation in the project are varied. In a country with virtually no animation culture, it was important to dispel the perception of animation as a medium for children’s entertainment. Cuteness was to be avoided at all cost, narrative strategies checked to avoid linear narration and style steered more towards expressive than illustrative. Thus a cartoon style was only ›allowed‹ where it also had a conceptual function: for a poem by a young poet about his insecurities about writing poetry (Loftus Marais – Confessions of a student poet) as it fitted in with the irony and the self-reflective nature of the poem. Media ranged from puppet animation to sand animation, and covered the broad range of developmental animation. Filmverse 1 has been successful beyond our expectations: The project was nominated for four awards at national arts festivals, and individual films went on to compete at international animation festivals. Naomi van Niekerk won the award for ›Best First Film‹ at Annecy 2016 for her film ’n Gewone blou Maandagoggend (An ordinary blue Monday morning) – a poem by Ronelda S Kamfer. Charles Badenhorst won the Jury award at the Backup Festival in Weimar, as well as a special jury award at the Silencio festival in Portugal. Six of the twelve films have been shown at International festivals. I always believed that animated films of international standard could be created in South Africa, and in Afrikaans, and the success of Filmverse 1 proved me right. I hope that Filmverse 2 will follow this good example. We followed the same recipe, but put more effort into training artists to animate. As a result the project has more first-time animators on board. 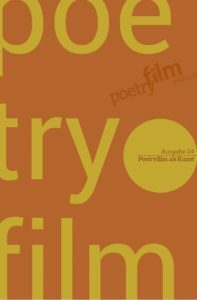 The range of approaches to the film poem has also broadened; there are more films which includes the text on screen, as both visual and conceptual element. In one film the poem was set to music, and turned into a love song. The DVD also has an English language option, as well as the option to watch the films in two indigenous languages – Sesotho and Zulu. Translating poetry is at best problematic, as the idiosyncratic play with the language is at the heart of the discipline. Translating a poem which has a strong visual component, adds to the problem – the translation should be the best version of the original that the new language can offer, but should also stay true to the visual interpretation. We decided to present the translations rather with a soundtrack in English, Sesotho and Zulu, than with subtitles. Since the visual component of the film is never merely illustrative, it is important to be able to pay full attention to it. Reading subtitles while also having to view the film and interpret the visuals (while also trying to comprehend the read poem) puts too much strain on the viewer. Sadly, the sound of the Afrikaans poem gets lost in this approach. Afrikaans is a young, modern and vibrant language, and to me it is fitting that we should be constantly exploring new ways in which to interact with it, keep it alive and vibrant and growing. Filmverse is my way to get poetry visible, to reach a wider audience (it is regularly screened on South African television) and to create valuable visual aids for its teaching. I hope there will be many more to come. Diek Grobler was born and grew up on a farm in the northern part of South Africa. He obtained a BA Fine Arts degree from the University of Pretoria in 1987, a MA in Fine Arts from the University of the Witwatersrand in 1996, and is currently reading for a Phd in History of Art at the University of South Africa. He has exhibited professionally since 1988 and his work is included in several major public and corporate collections in South Africa. Grobler’s art practice covers a variety of media and disciplines. Aside from his fine art practice, he has illustrated children’s books, and has directed and produced several short animated films which has garnered 4 international awards and has been included in the official programme of more than 40 international animation festivals. Since 2014 he has been creatively managing Filmverse, an animated poetry project which aims to advance Afrikaans poetry and animation. Films from this project has won awards at Annecy, the 1st Weimar Poetry Film Prize and the Silencio Poetry Festival in Lisbon, Portugal. He lives and works in Pretoria, South Africa. 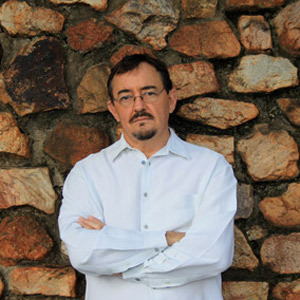 ▻ Diek Grobler: What about the voice?